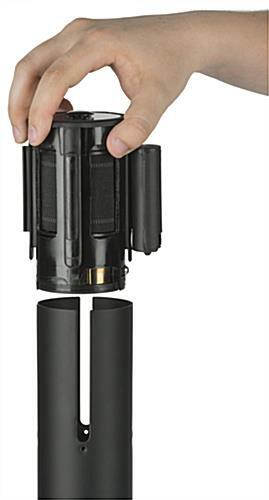 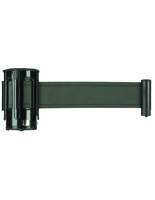 This retractable tension barrier is made from black nylon and comes complete with a 4-way adapter cartridge. 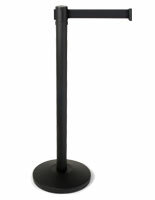 Designed to fit QueuePole.Deluxe stanchion posts only, the crowd control barricade accessory is a perfect choice for updating or replacing older or worn belts. 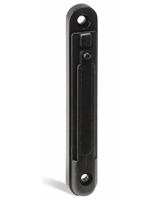 Each easy-to install black nylon tension barrier is 9.5 feet long and comes pre-installed in a plastic cartridge. 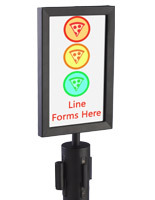 The 4-way adapter offers maximum queue management options. 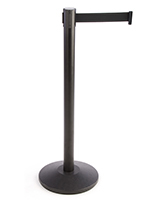 This QueuePole.Deluxe replacement tension barrier's nylon construction is designed to withstand heavy use in public environments. 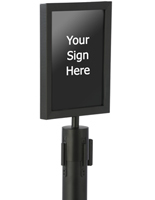 The neutral black color will complement any decor. 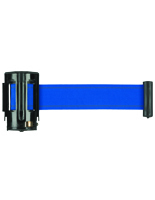 Please Note: This is a replacement belt for our QueuePole.Deluxe Stanchions ONLY. 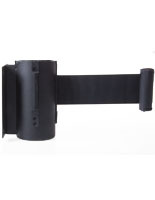 The cartridge is not compatible with any other stanchion models from QueuePole or other manufacturers.